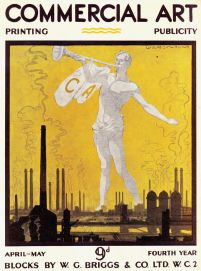 Commercial Art was published by Commercial Art Ltd. in 5 volumes (42 issues) between October 1922 and June 1926. It was conceived as a trade journal for the British advertising industry and contains numerous, well-illustrated articles on posters, poster stamps, printing, typography, letter art, illustrations, signage, point-of-sale and window display, packaging, etc. Among artists whose work is discussed or illustrated in Commercial Art include E. McKnight Kauffer, Fred Taylor, Tom Purvis, Reginald Frampton, Jean d’Yllon, Austin Cooper. G.M. Ellwood, H.M. Bateman, Frank Brangwyn, Harold Nelson, Fred Pegram, E.A. Cox, Frank Newbould, Herrick, Aldo Cosmati, Charles Pears, Horace Taylor, Lovat Fraser, Anna and Doris Zinkeisen, Laurie Taylor, Septimus Scott, Rilette, F. Gregory Brown, Edmund J. Sullivan, George Sheringham, Robert Braun, Frederic W. Goudy, Paul E. Derrick, etc.